Lets face it. Lib Dems members knew one thing about coalitions. The minor party generally does badly in the next general election. So we knew this was going to be hard. But damn it, this is very difficult indeed. The headline should really read 'A small group of Lib Dems planned to abandon the fees pledge'. This is because the same Lib Dems who were part of the negotiation team are the same Lib Dems who knew what was in the negociation document. So it's really they who planned to abandon the pledge. The rest of us had no idea. Nick Clegg did try to get the Liberal Democrats to drop this policy and he failed. Because the Liberal Democrats are a democratic party it meant that he didn't have that much control over policy and has to accept some polices voted on by the party members. As I said in A pledge is a pledge. End of . There is not much defence to a pledge. To pictures of you standing infront of a pledge, when knowing that the two parties you may have to negociate with both support tuition fees and won't pull back on it. Knowing times are hard and this would not be affordable. This was the big error. Perhaps the biggest error Clegg and the negociation team made. For a group of people so clever it is quite shocking that they didn't back away some MP's including themselves from this pledge. It is right in a first past the post election system for the rest of the party to remain ignorant of the negociation document because you have to fight for a government not for a coalition. However I think now we have had a recent coaltion perhaps we should release some details of our priorities for negociation before the next election so atleast people will understand the difference between negotiable policy and non negotiable policy. I still feel that the Lib Dems where caught between a rock and a hard place after the electorate cast their vote. I would also add that perhaps a policy to scrap tuition fees was not as fair as it first seems. Me and my brother did not go to university but my mum still paid through her taxes for others to go to uni. This doesn't seem fair. So I think it is more fair for graduates to pay something torwards their university education. The new system is like a back door graduate tax. It is a progressive system. The main problem with it is the cost or rather the cuts to higher education. I agree with some cuts because I don't think the state should pay the full cost but its the high level of cuts that have made the new system so expensive. It's worth listening to Stephen Nolan on last night show with Rob Wilson MP who wrote the book where this detail is revealed. Iain Dale, Mehdi Hasan, Dr Evan Harris and Helen Duffett discussing this topic from about 1.45 hours in. click here. It's not the NUS pledge that was discussed in the coalition planning documents, but the Lib Dem manifesto pledge to scrap tuition fees. They are two very different things. The issue of the NUS pledge was left alone until Browne. Good post on this dazmando. 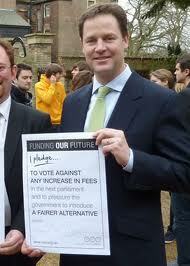 The Lib Dems turned back on their policies which is one of the reasons - well more so Nick Clegg over tuition fees. I've written on why there shouldn't be highter tuition fees and education cuts.